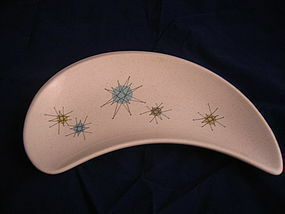 I've seen this crescent shaped dish called a side or salad plate, but I always thought it might be considered a bone dish. There are no chips, cracks, breaks, crazing or rough rims. It has been used, but I can see very little sign of use to the surface. Several dishes are available and priced individually. I need your zip code to calculate the postage. There are no chips, cracks, breaks or wear to finish. 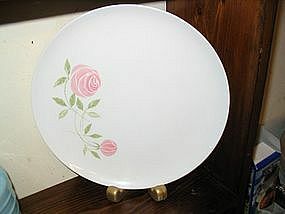 I have 2 of this pattern in the above condition, plus an additional 3 dinner size with light utensil wear and these are priced at $15.00 per plate. I need your zip code to calculate the postage. Vintage cigarette box manufactured in USA by Franciscan in Desert Rose pattern. There are no chips, cracks or breaks. The finish does not have any problems. I need your zip code to calculate the postage. 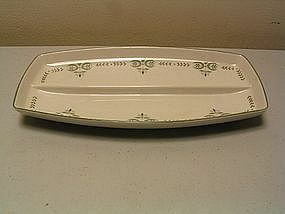 Divided relish dish measuring approximately 10" x 5 1/2" No chips, cracks, breaks or paint loss. Very little signs of use. Creamer and sugar are available. I need your zip code to calculate the postage. 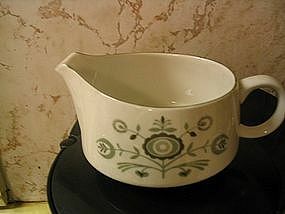 This creamer is marked with the "Family China" logo which dates it to 1960-1965. There are no breaks, chips, cracks or finish loss. 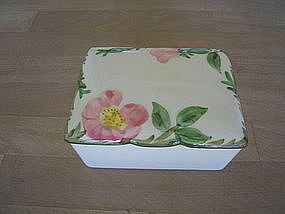 Covered sugar dish, bread and butter plates and relish tray available. I need your zip code to calculate the postage. 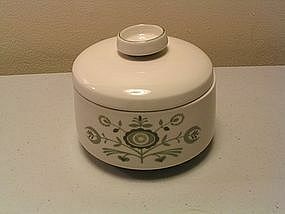 Covered sugar bowl which is marked with "Family China" which dates it to Franciscan's production from 1960-1965. No chips, cracks, breaks or loss to the finish. Creamer, relish tray and bread & butter plates available. I need your zip code to calculate the postage. 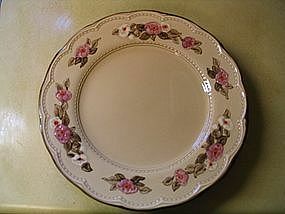 Dinner plate (10 3/8") in whitestone with pink and green floral design. There are no chips, cracks, crazing or paint loss. There are utensil marks predominately in the white area that I have tried to show in photos. The price reflects the condition.